Unique Bridal Accessories: Bridal Accessories with a twist! Looking for accessories that will be as memorable as your wedding dress? If you are looking for some statement pieces that will inject personality into your wedding outfit and look fabulous at the same time then I have got some real treats for you below! I love these Amira Barefoot Bridal Sandals by PS With Love. The detailing is exquisite with a beaded anklet that then cascades down the foot in a series of floral shapes. This is the ultimate in foot apparell for the destination bride who is getting married on a beautiful white sandy beach. Paired with a flowing chiffon dress these barefoot sandals would really have the wow factor. These sandals retail at £195. 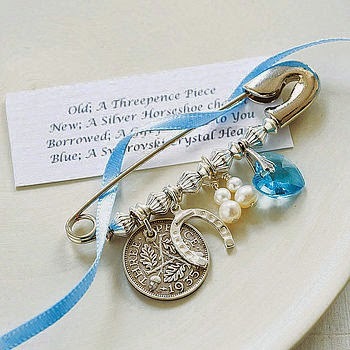 This Bridal Charms Pin is so cute! I adore how it is based around the concept of "something old, new, borrowed and blue" as that card above explains. I think that there is plenty of scope to use this pin in your bridal outfit - whether it be pinned to a birdcage veil or to a bridal sash. You could even buy two and pin them to your shoes. These pins are by Betty's Glamour Box and retail for £27.95. This Bridal Chiffon and Velvet Rose Hair Piece is a real statement hair accessory. If you are looking to dress to impress with your accessories then this is a real winner. I think this floral hair piece would look great paired with a simple chiffon dress and an impressive clutch. This hair piece is from Aurora Rose Bridal and retails at £119. Are you planning a Victorian style wedding or a real regal affair? You can't get more vintage chic than a wedding parasol! 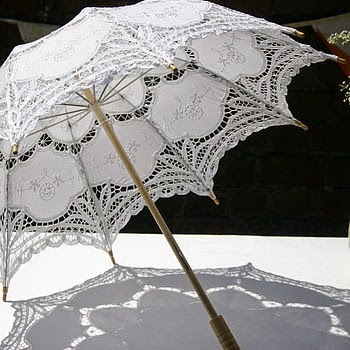 I fell in love with this bridal parasol as soon as I saw it. This would be an amazing accessory to have in your wedding photos. This parasol is by The Brolly Shop and retails at £38. 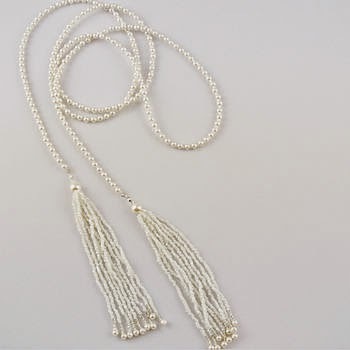 If you are a Gatsby bride looking for a classic piece to complete your look then this might be just what you have been looking for.This Lola Deco 1920's Style Silver Pearl Lariat is a great way to add a bit of sparkle to lace art deco dress. I love the tassels! This lariat retails for £118 and is available from Britten Weddings. How adorable is this Something Blue Ribbon Ankle Bow by Just For Eve? I think this you look stunning on a bride who has opted for a tea length dress in the vintage style! I love the pretty diamanté detail that give it that bit of special day sparkle! If you have opted for a pair of plain ivory courts then why not jazz up your look by wearing a bow on both ankles? This is also a great option for the bride who doesn't want a tradition garter under her full length gown but wants something unique. This piece is available from Just For Eve and retails at £21. WOW! 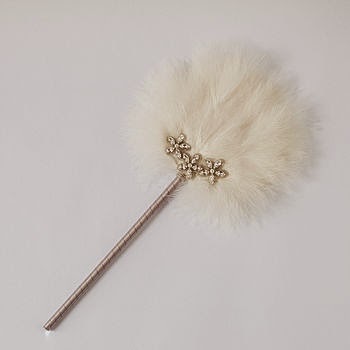 You can't get much more decadent than this bridal feather fan! If you are having a masquerade themed wedding then I think this would really make you the belle of the ball! This is another accessory that would look fabulous in your wedding photos. This fan is by Britten Weddings and retails at £168. Are you looking for something different from the tradition bridal jewellery of freshwater pearls or statement silver necklaces? 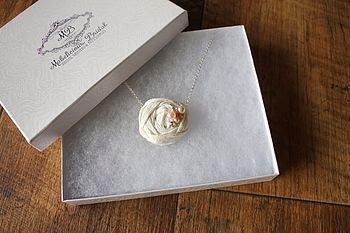 I think this rose necklace by Mabelicious Bridal has a real vintage vibe. This necklace comes in different colours so you could opt to purchase necklaces for your bridesmaids and flower girls in other shades too. These pretty Rosebud Sophia necklaces retail at £22.50. I think this option of a bridal hair turban is a great one. This Silk Turban Band by Faulker and Carter London is a unique alternative to traditional hair accessories. I think that this would tie in well with a dress with a satin waistband. If you are looking for a hair accessory that is simple and elegant then this is a fantastic choice. This turban retails at £75.